I love mayonnaise on my sandwiches, but I always shy away from putting heaps of it in salads. 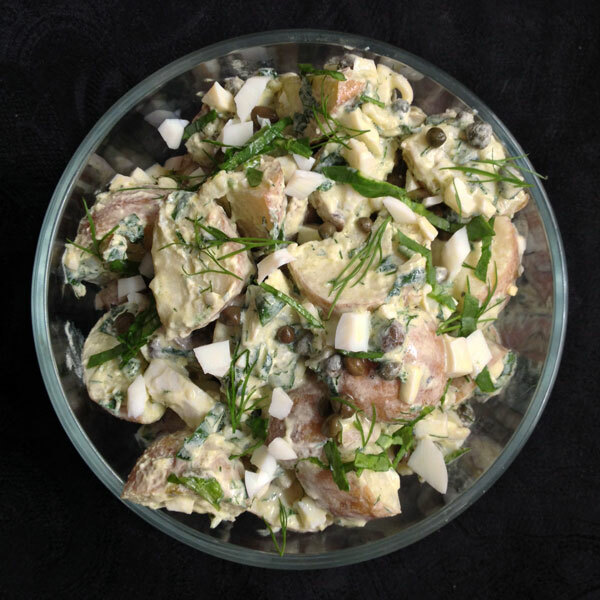 This is a no-mayo potato salad recipe, leveraging hard-boiled eggs and olive oil as a mayo replacement. Picnic-style potato salad (aka best served cold) can be prone to dryness, so sour cream is added for creaminess, though plain yogurt would work just as well. The capers add little pops of salt which is addicting. Dill and shredded spinach is added for extra flavor, though any dark green leaf vegetable — kale, mustard greens, collard greens, etc. — would work just as well. Just mix it all together after the potatoes have cooled off. 1. Boil the eggs. Place eggs in a small saucepan and fill with water until the eggs are covered by an inch. Cover and bring to a boil over high heat; when water is at a rolling boil turn the heat off, keeping the lid on. Let sit for 12 minutes. Fill a bowl with ice and water, and move the eggs to the ice bath. Let sit for a couple minutes then remove shell. Chop the eggs and place in a salad bowl. 2. Cook the potatoes. Fill a large saucepan with several inches of water and bring to a boil. Scrub the potatoes and cut into 1-inch chunks. When the water is boiling, add the potatoes and partially cover. Cook until potatoes are fork-tender, 15-20 minutes. Drain the potatoes and transfer them to a sheet pan to cool, then add to the salad bowl with eggs. 3. Mix the salad. Add the sliced spinach, sour cream, olive oil, capers, minced dill, minced shallots, salt and pepper to the potatoes and chopped egg. Stir gently until all of the ingredients are well combined. 4. Store and serve. You can serve this right away or, even better, make it ahead and store up to several days ahead so it is completely chilled.